Bethlem myopathy is a benign autosomal dominant form of slowly progressive muscular dystrophy due to mutations in the three COL6A1, COL6A2, and COL6A3 genes encoding the three chains for collagen VI. Bethlem myopathy is the benign phenotypic variant of the more severe Ullrich congenital muscular dystrophy with recessive inheritance and with mutations in the same genes. To date, less than 100 cases with Bethlem myopathy have been reported. 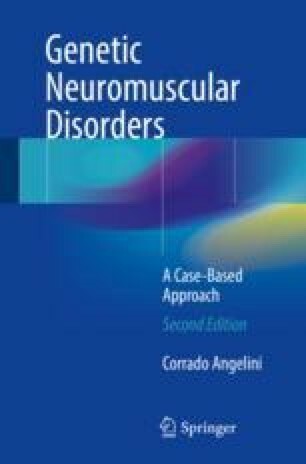 The clinical features do not differ from those of other mild forms of muscular dystrophy with the exception of finger contractures. The onset of the disease is usually in early childhood or more rarely later. Patients present with delayed motor milestones, proximal limb-girdle muscle weakness, and joint contractures involving the elbows, ankles, and last four fingers (the “prayer” sign). In contrast to Emery-Dreifuss muscular dystrophy, contractures of the neck and spine are rarely seen. The progression is slow and the severity is variable: about half of patients are wheelchair bound after the fifth decade; respiratory failure may occur in late stages.